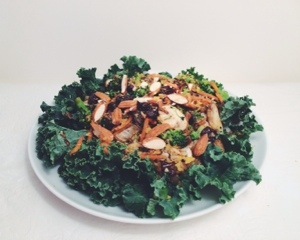 When I remade the Adventurer Bowl from Life Alive, it was the highlight of my day. Heck, it was the highlight of my week! Fine! Easy enough for me. I decided to switch it up and make my dad’s favorite from Life Alive: The Swami. I’ve tried both at the restaurant and the Adventurer is still my go-to. However, the dishes are completely different so to each his own. … I should probably stop with all these remakes. I mean is this even legal? Can I get sued by Life Alive for this? It would be worth it. >> Sauté onions, mushrooms, broccoli and carrots in oil. Chop almonds and roast them slightly in a separate skillet to bring out flavor. 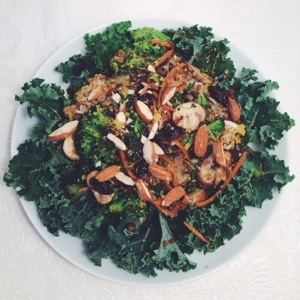 Chop Kale and arrange on a dish. Add cooked brown rice and quinoa blend. 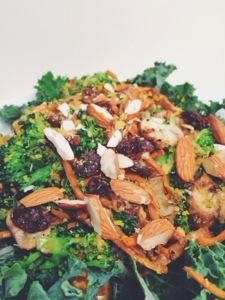 Top with sautéed vegetables, almonds, raisins, and nutritional yeast. Drizzle the sweet curry miso dressing over everything. 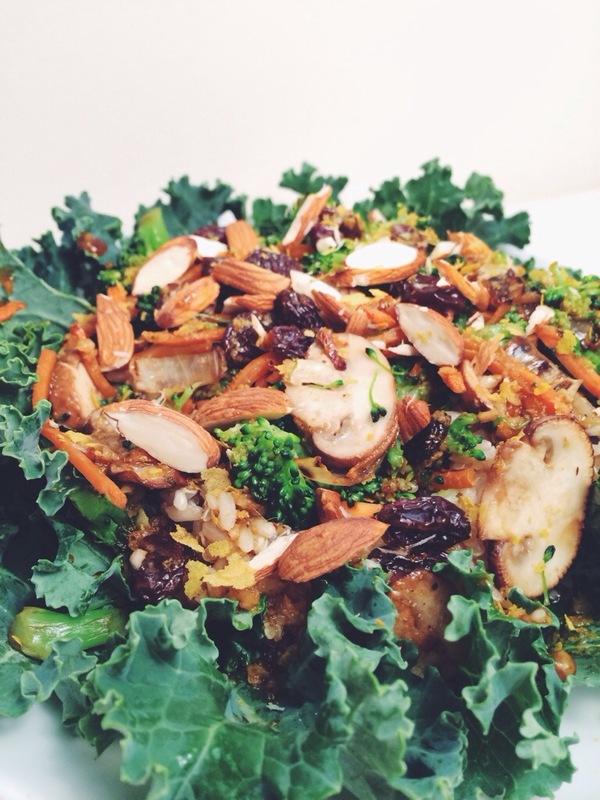 *I used Seeds of Change ready to heat packs, but you can make your own brown rice & quinoa mix. FeedMeColor is your meal plan go to! In February 2014 I was placed on a meal plan. It was stressful, confusing, and I needed help. I created FeedMeColor to create recipes and meal ideas for those who are following a meal exchange program, counting carbs, or need help with meal planning. Meal plans are followed for a number of reasons including illness and weight management. In this program, you are allowed a daily amount of each food group. For example, breakfast could be: 3 Grains, 3 Proteins, 3 Fruits, 3 Fats, 1 Dairy. "Meals" are meant to give inspiration on what a colorful, balanced meal looks like. They are based off of my exchange plan but can be easily edited to fit yours! "Recipes by Group" helps you fill in the gaps in your meal plan. For example, if you are missing 1 protein from your meal, click the protein tab under Recipes by Group. "Recipes by Carb Count" sorts recipes by the number of grain exchanges it has. I originally created this option for diabetics, but found it is helpful for other readers too.